PRICE OF GOLD backed down $17.40 to $1,060.10, and SILVER closed the Comex 8.5¢ lower at $13.814. Silver and gold prices have spent this week regurgitating all the gains of Christmas week. No doubt lots of this arises from tax loss selling. Good side is that it merely offers us an opportunity to buy a little lower. In spite of the last two days gold prices indicators mostly point up. Don’t bother writing to tell me I’m a miscreant and a moron, I’m just reporting the facts, and the facts speak for higher GOLD PRICES. However, gold is only spinnin’ tires (we say “tahrs”) and throwin’ mud until it climbs over that fence at $1,088 and commences running up the road. 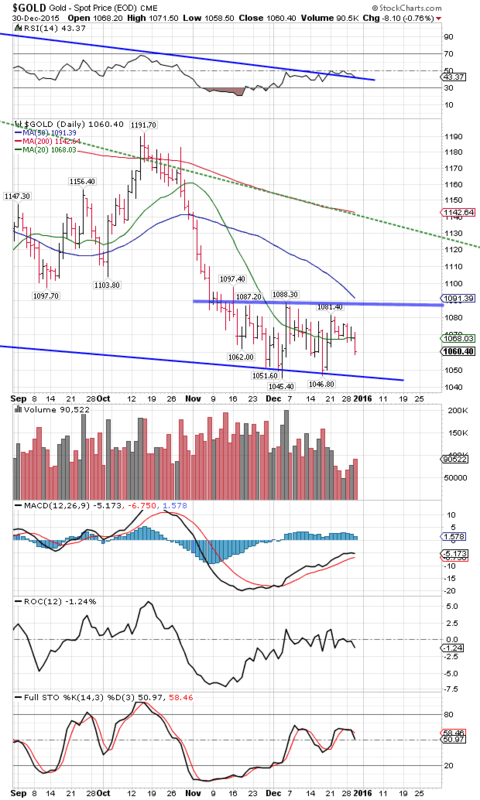 The PRICE OF GOLD has made a bottomy-looking sort of upside-down head and shoulders formation, or reversal zone. Still, that needs confirmation by rising above $1,088. 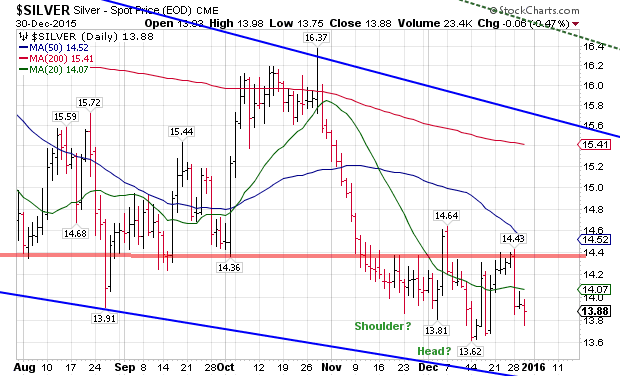 Silver’s chart resembles gold’s, but looks more like an upside-down HandS. Closed below its 20 DMA today. SUMMARY: 2016 will be the year for silver and gold prices and the year stocks fall into the abyss, along with the Fed’s cockamamie Keynesian schemes. I sure hope y’all aren’t in debt, cause 2016 is liable to pull big debtors through a knothole. Might ought to order your house. Wall Street scanned the sky in dismay today as Santa Claus packed his rally in his sleigh, shouted to his reindeer, and lifted off into the sky, headed for the much-scorned Midwest. “Sorry Christmas to all, and to all a good night!” he yelled over his shoulder. Didn’t even drop off a single pair of pointy-toed Eye-talian shoes off for the waiting Wall Streeters. Dow melted yesterday at 17,750 (2,082.50 for the S&P500), traded sideways most of today, then melted again about 3:30, as if everybody suddenly sold and ran off the trading floor. Dow puked back 117.11 (0.66%) to close at 17,603.87 and the S&P500 scraped off 15.0 (0.72%) to end at 2,063.36. If they do these things in the green tree, what will they do in the dry? If the Santa Claus rally stumbles like this, what happens when Icy Winter arriveth next week? Both indices are near to closing 2015 lower than 2014. 2014’s closes were 17,823.07 and 2,058.90. Tomorrow will tell. Just in case I have been so mealy-mouthed y’all couldn’t catch my meaning, I expect 2016 to be a very bad year for stocks, beginning in January. That augurs in turn the Fed panicking and belching out new torrents of Quantitative Easing, which don’t leave the dollar looking too perky, neither. Aww, pay me no mind, I’m jes’ a nat’ral born durn fool from Tennessee (but I don’t believe in no Santy Claus). Speaking of the scurvy US dollar index (I reckon I have to, though it’s a grief to a fastidious mind), it rose 12 big basis points today (0.12%) to 98.29. It’s still trapped below the downtrend line, and the market has gone so stagnant hat it has a blue sheen on it and the 20 and 50 day moving averages have intertwined. To regain momentum for a rally it must close above 100.70, which looks almost as likely as a Poland China sow learning the foxtrot. Trend in force remains in force until contradicted. 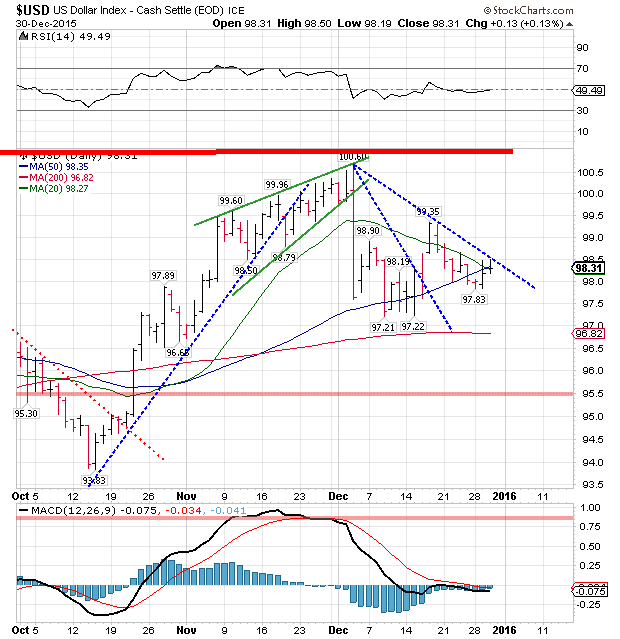 It would take a close north of 98.50 to begin to turn the dollar index up. Only hints it might turn up are in the Rate of Change and full stochastics, but they remain hushed hints. Should the dollar break its 200 dma at 96.82, mass confusion would break out. Not that we have much less than that already. Euro rose a token 0.1% today to 1.0932, barely above the 20 DMA but in no haste to rise higher. No ambition. Yen can’t rally either. Lost 0.8% today to 82.96 in a market that has done little for the past week. 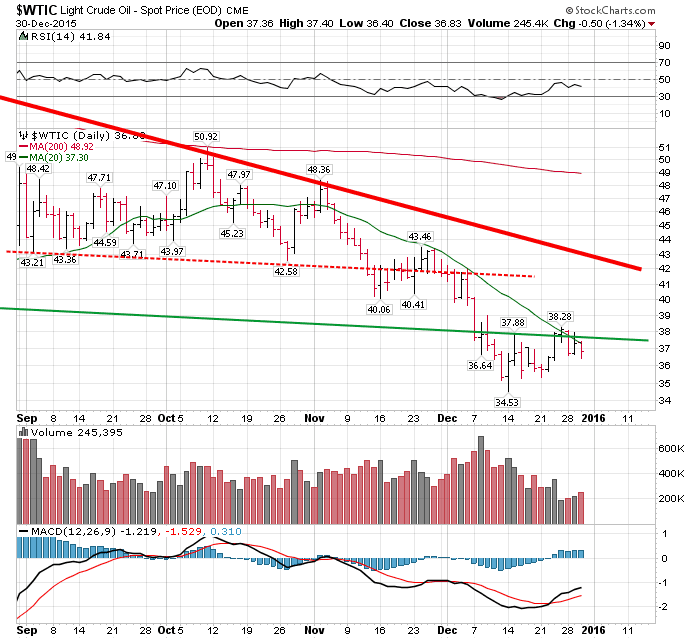 Oil (WTIC) lost 1.34% to $36.83/barrel. Barely below its 20 DMA. Keeps refusing to break down. Maybe 2016 will be the year for commodities to turn up? Another inflation market, Copper, bottomed back in November at $2.00 and has traded sideways since. What’s at stake? It’s hanging over a cliff, and down at the bottom is the 2009 low at $1.25. If copper doesn’t hold on here, it’s looking at a long fall. So why is it holding on?